In an effort to be happier, I’m working at being mindful of all of the great things going on in my life and beyond. It isn’t easy, but these post help me ignore the crap and focus on all that is good. Jen Spends was a blogger I connected with a long time ago. I enjoyed her writing, but then her posts became sporadic. 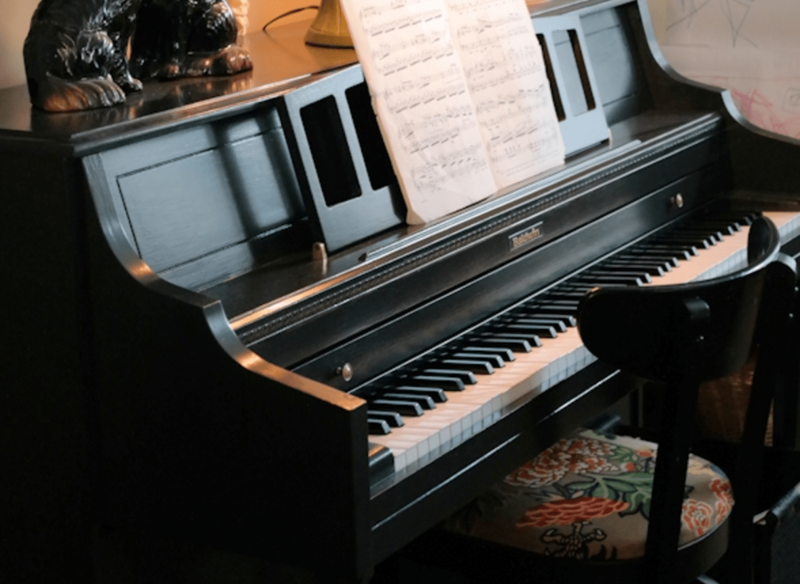 Recently, she’s been posting again and I loved this wonderful story about how she restored a childhood piano that was destined for the dump. I’ve travelled all over the United States, but the Northeast has alluded me. Not anymore! This summer, we’re going to knock out new territory. After that, we’ll head over to Vermont to visit a certain greyhound. We’ll finish the trip with three nights in New York City. I can’t hardly wait! And we’re doing the whole trip on the cheap. The airfare cost us nothing (yeah, travel hacking!) and since we’ll be staying with friends, we won’t be spending much on accommodations either, at least in Maine or Vermont. Pizza: I’m a die-hard Chicago style deep dish guy and am deeply skeptical of your thin pizza New York City. However, I’ll reserve full judgement until I try it. Mad Fientist recommended Grimaldi’s. Accommodations: Holy crap, NYC isn’t cheap. I’ve paid over $200/night for a hotel room exactly once in my life. This will all change in New York. Beer: Does NYC have a microbrew scene? *Big thank you to my friends Erin over at Broke Millennial and Brad at Richmond Savers who have already supplied lots of great information. Yay for travel hacking! Glad you’re able to explore the northeast! It’ll be a great and fun trip! This week, I’m thankful for the DOW passing 21,000 (yay, our portfolios!) ans being able to stick to my meal plan and eat healthy! Now the only thing I have to fix left is my sleep schedule! In the scary backdrop of the raging bull market, Mr. 1500 wants to visit the Wall Street bull? Holy smokes, that’s a sell signal. I am not waiting for any shoeshine boy to meet you there to give any stock tips! Going from 100% stock to all cash tomorrow! ? Seriously, enjoy your visit! NYC nearly robbed me blind few years ago, still looking for that $20 bill I lost in the subway. ? I have a post coming up on March 15 on learning from an investment oracle (not the one everyone thinks). Hope to have your views on it. I know! The second I touch that thing; BOOM! It’s all going to hell! Market timers, get ready to hit the sell button. If you sign up for my newsletter, I’ll tell you the exact date and time! I’m going to second the Mad Fientist and say Grimaldi’s is top notch. But it has to be the original location under the Brooklyn Bridge. Another good place to go in the summer is Coney Island. You get the original Nathan’s hot dog + the beach + amusement park for the kids! Not sure about microbrews exactly, but I believe you can take a tour of the Brooklyn Brewery. there are also many bars in Manhattan that specialize in having every beer possible. For an old school NYC bar feel I would recommend McSorleys. Let us NYCers know if you’re doing a meet-up! I’m glad you said that. I was at a chain Grimaldi’s in Phoenix and while it wasn’t bad, it wasn’t great either. Meh. Meetup? We may be attending another one. I’ll post it on the blog if it happens. Can’t argue with a self-made billionaire. Going to try some street meat while in NYC? When sampling pizza, don’t go to Sbarro’s. It’s not the real stuff. Let me know when you be hitting the big apple. It would be great to meet up. I’ve driven the corridor numerous times as every year my wife’s family goes on vacation in Maine. I might recommend one thing. If you can spare the time consider going back through Albany rather then down through 91. Along 87 are the Catskills mountains. That means less traffic and some good hiking trails. Again it might not be your thing or there may be something on that drive back you want to see. I second that, driving down 87 you get to see the Hudson River/Valley and understand how majestic it truly is. I LOVE scenic drives. The slow road is the good road. Thank you both for this suggestion. I just looked at Google Maps and it’s not that much longer, so I’m doing it. There are a lot of micro-breweries in upstate. Even some micro cideries 🙂 Many just off 87 both north, south, and in Albany. So if you are going to go that way you can get your micro brew fix. Honestly too many to name. Cideries! You just won Mrs. 1500’s heart. Oh man I am so jealous of your pizza eating trip to NYC!!! I have been to NYC once and I ate pizza at least once a day to try all the different places. I grew up on thin slice pizza and always thought of Chicago style as something I needed to eat with a fork and knife. Nothing wrong with that but it didn’t seem like pizza to me since that’s not how I grew up. You’ll have to share your experience and more importantly your ratings on pizza places. Mustard Seed Money recently posted…Guest Post: How Can Parents Raise A Child Without Incurring Debt? DUDE (dudette? ), you should come join us. I LOVE pizza. We are pizza soulmates. We could pizza-tour NYC! Looks like a great trip! I’ll be curious to hear how it goes. Flying with kids right? Interesting HaHa. We have a trip planned for this summer as well, driving from Michigan to Montana to stay a week and visit Yellowstone. We have 3 kid’s, 12,7, and 5, longest road trip yet. Not brave enough to fly with them yet!! Yep, kids. They do well in planes though. When they were 3 and 5, we flew to Hawaii (also for free) and we had no issues. It sounds like you’re be up north, but if you make it down to Colorado (Boulder County), stop on by! And a road trip with children? THAT is painful, to me anyway. And that is only 5 minutes in. If you need a place to stretch your legs in Maine, I have friends in Portland you could meet! He’s Pete’s friend “Ben” the car guy. They also know where the best gelato place ever is. I went to visit them last year and had a blast! Oh wow, yes please! I remember the car guy. Honda minivan, correct? Hook me up! Sounds like a great trip! I agree on the grimaldis suggestion. Have you considered airbnb instead of a traditional hotel? AirBnb is a great choice. A couple years back we stayed at an Airbnb in Weehawken, so it was just a short bus ride to Times Square. For a 2 bedroom place with a nice kitchen and large living room, 5 minute walk from an incredible view of Manhattan, we paid about $250/night (which then got split up several ways in our case). I shudder to think what we would have paid for a similar place in Manhattan, and it was really only a small inconvenience to bus in. Whoah, that’s a great deal. Never would have thought of staying there. Thanks for the tip! In full disclosure I haven’t yet tried Grimaldi’s, but for my money the best (and very reasonably priced) pizza by the slice in NYC is at Pizza Suprema which is close to Madison Square Garden (http://nypizzasuprema.com/). I enjoyed the beers at Flagship Brewing on Staten Island (http://theflagshipbrewery.com/). It’s a nice frugal excursion across on the Staten Island Ferry (free – great view of the Statue of Liberty) and then a short walk down to the brewery (pints were ~$7 if I’m remembering right). There is also a lovely small museum on the history of Staten Island close to the ferry terminal (part of Bank of America’s Museums on Us program if you happen to be there on the right weekend). Thanks so much for the suggestions! I just added Suprema to my Google Map. I noticed it has great reviews. CAN’T WAIT to try. Not that I’m obsessed with pizza or anything. OK, I am. And yeah, we were already planning on taking the Staten Island Ferry, so the brewery works out great. If you’re around (first week of August), stop by and I’ll buy the beer and/or pizza. Grimaldi’s pizza is pretty solid if you go you should go to the one in Chelsea if you are in a time crunch. If not the one in Brooklyn is near the park which is also nice. I like a coffee shop near there called Brooklyn Roasting Company, very cool vibes. What else do you like to do? I can give you a ton of free things that are fun and a lot of great restaurants. Oh man, thanks so much for the offer. Walking tours and architecture are always good. Brad Barrett told me about the High Line which seems nice. I like airplanes and I see the Intrepid has the Enterprise (test space shuttle). I also like just taking in funky neighborhoods on foot. -If you can make it to Whythe Hotel for drinks one night for drinks the view is amazing or Ink48 if you want to sick to Manhattan. If you narrow down the neighborhoods any farther I can give you places near your destinations. Here’s a tip for staying in NYC. The Cheapest Hotels will be around Times Square… especially during the week (i.e, Monday night through checkout on Thursday). At the same time, stay away from Times Square (except for an evening walk through). It’s crowded and has the worst restaurants in the city. If you do end up staying in Times Square… Hell’s kitchen is few blocks away and makes for much better wandering (and restaurants and bars). If you can swing it, stay in either the Upper East Side or the Upper West Side (70s to 80s). Close to museums, close to Central Park, and you get a much better feel for what an actual NYC neighborhood is like. Best Pizza: “Prince Street” on prince st. Though, I find most pizza in NYC to be really good. Just stay away from pizza chains (Sbarro) or deli’s. If they don’t warm up your slice in a real pizza oven, then STAY AWAY. Advice: Get breakfast from street vendors. Walk across the Brooklyn Bridge. Ride the Staten Island Ferry. Explore the Cloisters and the East Village. Ride the Subway once, but take the Bus (it’s slower but you get to “see NY”). Go inside any Churches/Cathedrals you come across. Finally, watch the Rivers (Hudson or East). Nathan, thanks so much for the great suggestions. I just found a place in the Upper West Side (Empire Hotel) which looks like a great location and won’t bankrupt me. Prince Street! Ha, I already had that one saved to my Google Map! YES…the 1500’s are heading east! If you are planning a meet up in New York, keep us posted. Would love to meet the dinosaurs in person. Glad to see you have your priorities straight and are planning a stop at the new Alchemist Brewery in Stowe. Grab some Heady and the other offerings that they have. Might suggest some other great breweries on the way up and down the coast: Trillium (Boston area), Maine Beer Co. and Treehouse (MA) have been uber popular of late in terms of NE style beers. And yes, there is absolutely a huge beer scene in New York/Jersey. Grimm, Three’s Brewing, Other Half to name a few, but Brooklyn is killing it right now with new breweries. If you can get over the border into NJ, Carton Brewing and Kane Brewing (IMHO) are really great as well. For NYC Pizza, Lombardi’s, hands down…all of the guys that start the best pizza places in the five boroughs all have roots back to Lombardi’s. Might as well go to the original. On the hotel front, yeah its New York prices…could cross the river and save a few bucks in NJ, but might not be your thing based on time and convenience. By any chance did you get a chance to catch the Warren Buffett documentary on HBO last month? It was pretty good, nothing really new, but did serve as a nice background to the man outside of the investment focus. Made me think a little more about the importance that spouses/partners play in the financial independence journey to maintain household-life balance and alignment. Without Susan Buffett, Warren may not have been the success he is. Dude, the Alchemist produces some of the finest liquids I’ve ever put in my mouth. Holy cow. I’m obsessed. And oh yes, I’m stopping at Treehouse (I’ll tell my kids the name and hopefully they’ll think it’s an actual plaything and won’t complain). Trillium too if we’re in the area. Lombardi’s! I just checked and already had it bookmarked, ha! I didn’t see the the documentary, but it’s on my list. We may attend a meetup related to real estate which I’ll mention later on, but it would be cool just to hang out too. We’ll be in the big city 8/1-8/4. Prior to that, we’ll be in Vermont if you’d like the chat over a Heady Topper. I grew up near your trip path. I head back to New England quite often to visit friends and family. Once the trip gets closer we should chat and see if our trips overlap! That would be great! We’ll be in NYV 8/1-8/4. Maine and Vermont will be the previous weeks. Oh Fritz, thanks so much. My face is turning red right now. Even though I’ve met the Frugalwoods in real life, I still don’t believe they actually exist because their life is a fairy tale. I liked Travel Inn a couple of years ago, when I went to NYC. It was definitely less than 200/night and it was in Manhattan. I personally preferred visiting Chicago and DC than NYC though. Buffett and Bogle have been appreciative of each other for years actually. I believe that Buffett wrote the foreword in one of Bogle’s books, but it is not in front of me so I may be wrong 😉 It is funny that in the early 1990s Buffett was dismissive of the idea of buying the whole haystack. However, by the 1996 letter he changed his opinion. It just goes to show me that to be a superinvestor, you should be willing to be flexible and change your mind if new information comes your way. Oh man, the airlines and Apple. I don’t know what to think about it. Maybe it was Ted and Todd? And yeah, our mutual friend Morgan Housel mentioned Benjamin Graham changed up his style over the years too. I think Housel said that indexing will run it’s course too. Change or die baby. 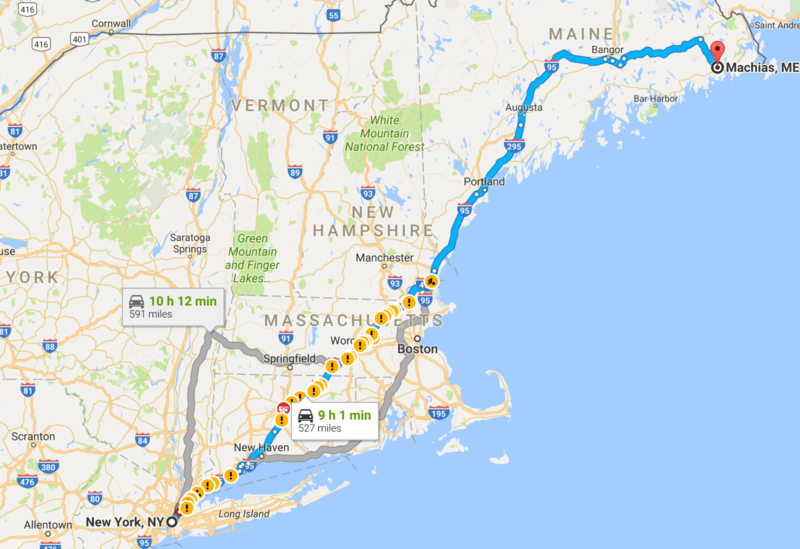 The route you’ve charted takes you through Bangor, which is next door to Orono—the flagship outpost of Pat’s Pizza. Pat’s opened in 1931 and looks the same today as it did in the 1950s with the same counters/barstools, worn down formica tabletops, and an old wooden pay phone booth. Best pizza in Maine (and maybe anywhere)! I just added it to my map! Thanks so much Mr. Moose! See you next weekend! I want to visit the hound next fall! The NE is amazing that time of year! NY? Hmm, tough one. Maybe Air bnb is cheaper, or maybe crash with NY-based blogger, although that might be a bit cramped. And I hope no one kills me, but I kind of thought NY pizza was over-hyped. But maybe I didn’t get the right pizza? Tonya@Budget and the Beach recently posted…February Rewind: The Cat is Still Alive! Have great fun on your road trip! Should be epic indeed. The other letter that made me happy recently was the Gates Foundation letter to Warren Buffet. So much good stuff happening in the world, so many happy stats. Your upcoming trip sounds epic, yay for travel hacking. I was approved for the next CC in my slow churning list yesterday – the Ink Business Preferred. 80k UR points, here i come! Yes, Bill Gates is a wonderful person. I love how he convinced Buffett to give his billions to charity too. Nice work on the UR points! They rock! Awesome! NYC is expensive but I thought you were travel hacking…use those Hyatt/IHG free nights or points. Or you can stay a little outside of Manhattan for more affordable accommodations. If you plan on driving, download SpotHero or BestParking apps. Parking in NYC is expensive and the garages vary so much. One place might cost $40 where another one down the block is $20. What sights do you plan to see in NYC? Microbrew scene…not sure but I would imagine Williamsburg, Brooklyn might be the spot to hit up for that scene. Sites? I really want to see the Wall Street Bull. I LOVE the store behind it. After that, walking the Brooklyn Bridge, the Staten Island Ferry and just exploring different areas on foot. Hell no to driving! Bus or subway. Good choice on taking public transportation. When we have friends visiting, we often take them on the Staten Island Ferry (free! ), go to the Bull which isn’t too far, the 9/11 memorial is also nearby as is the Brooklyn Bridge. We go to Chinatown which isn’t too far away for some cheap souvenirs and then go to Times Square…yea it’s touristy but hey they’re tourists! I completely forgot to mention it, but I”m OBSESSED with the bull. I LOVE the story behind it. Seeing the bull is number 1 on my list of stuff to see (pathetic, right?). When is the best time to see it? I think you will LOVE New England! Last summer my husband’s folks met up with us in Boston, where we stayed for a few days before traveling up to Portland, Maine. It was my first time staying in Maine, and I loved it. The seaside is really something special. I’ve been south numerous times, but something about the New England coast really struck a chord with me. I think it will become a regular destination for us. Looking forward to hearing about your trip! I CAN”T HARDLY wait for the trip! Can you tell I’m excited??? STOP. Live in the day. Not the future!! Be interesting to see your thoughts on well, I’ve been a couple of times and didn’t like the feel of the city. Hoping it treats you well and it’ll be interesting to see your thoughts on the Big Apple. Everyone has been giving some great pizza place, I’d figure I would give you a microbrewery suggestion. Since you’ve hinted in the past that you’re a fan of the NES Classic, my suggestion would be Barcade (https://barcade.com/). There’s one in Brooklyn and I think two in Manhattan now. They have original classic arcade games for a quarter each, and the beers are great, although not cheap. That place looks awesome! Thanks so much. And I’d love to buy you a beer and/or pizza. We’ll be in town 8/1-8/4, so pick an evening and let’s have a couple. No problem…Barcade is always a fun time. Definitely! Although I think I should be buying you a beer/pizza since you’re coming into my neck of the woods. Anyway, what would be the best way to contact you to setup an evening? Shoot me an email at mr1500@1500days.com. I know I’m planning way in advance, but as of now, the evenings of 8/1, 8/2 and 8/3 are all open. Epic trip, my man. I’d get the Hyatt card. You’ll get 2 free nights at any Hyatt, then book a room at the Park Hyatt New York. Cost like $700 per night with real money. The S&P bet is like taking candy from a baby. It’s not even close. Thanks for the Hyatt suggestion! Oh wow. Thank you for sharing the Warren Buffett (Duckett?) duck. I loves it. 🙂 Oooh, Maine is a great choice! I’ve never visited myself but it looks beautiful. It’s great for both visiting the coast and experiencing some beautiful woods. Ahhh. There will be no shortage of Frugalhound pictures. Do you think I’ll be able to balance the dinosaurs on her? Yeah, deep dish takes foooooooreeeeeeverrrrr. More time to make room for it! I’m sorry about the bad meds. I hope the new one works out better for you! No, no and NO. Don’t to go Grimaldi. As an Italian and as someone who lives in that ‘hood I can only attest that Grimaldi is a turist trap (and they don’t take credit cards, which limits your cashback abilities). In the same neighborhood (Brooklyn Heights) and not too far from the Brooklyn Bridge Park (where everyone takes those nice pictures of downtown Manhattan) try Luzzo ( http://luzzosbk.com/) or Sottocasa ( http://sottocasanyc.com/ ). Inside Brooklyn Bridge Park there is Fornino with spectacular views of Manhattan on the roof terrace ( https://fornino.com/locations/brooklyn-bridge-park.html ). If you’re in Mahnattan, Ribalta ( http://www.ribaltapizzarestaurant.com/ ) near Union Sq is to die for. For accommodation, definitely look at AirBnB although recent legal changes limit the ability for landlords to rent a whole unit for <30 days. One hack is to go across the river in Hoboken or Jersey City: you're only 1 stop away from Manhattan via PATH train (basically a subway) but for a much cheaper rate. 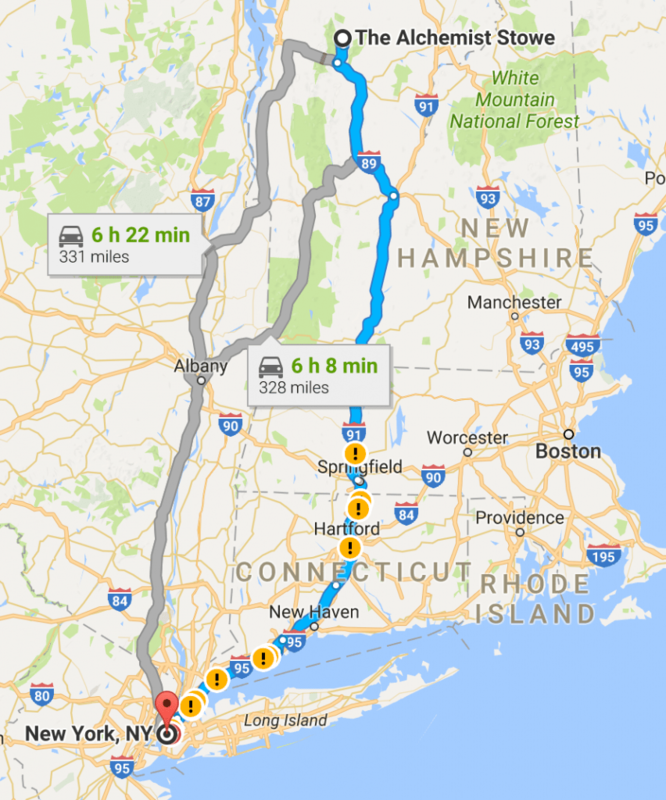 Also certain parts of Brooklyn will likely be cheaper, but don't book at random because it can be a little rough around certain areas. Definitely up for joining a meet-up in person if you're coming to this side of the world! Alberto! Wow a dissenting opinion on Grimaldi’s! Ha! I just looked at those websites and they all look awesome. I think that I need more time in NY. You have no idea how conflicted I am right now. Thanks for the information on Airbnb! Yeah, I’ll find a place to stay that is either conducive to meeting up or close to something. Hope to see you the first week of August! So me and the family are going another time this year to DC/NY, please pass along your Pizza, Beer suggestions, i’ll be there first, also please stop visiting places I plan on going to, thank you. Will do! I’ll share my custom map with you. Any day with more Warren Buffett is a good day. He is truly a national treasure. They should tear out the wallstreet bull and put up a statue of Warren instead. I’ve been reading his shareholder letter for decades now…it’s like Christmas when a new one comes out. Wouldn’t miss it for the world. Enjoy the trip to the east coast Carl! Great highlights of the buffet letter. I have yet to read it. And California is pretty great! I understand about missing your home though. I still miss the Midwest where I’m from. If you are near Providence, RI and want to hit some breweries and other fine items I am more than happy to show you the ropes. Jason, it would be awesome to meet up! I’ll let you know if we’ll be near. And if you happen to be going through Providence during Water Fire (every other Sat. ), check it out. We did a road trip to Bar Harbor a few years ago and this was one of the highlights. Thank you Lisa; really appreciate the recommendations! Thanks so much for the recommendations. I see that Juliana’s is right next to Grimaldi’s, so if one is crazy busy, I’ll use the other as a backup plan. Enjoy the travels! I’m currently planning for a big trip, but I’m looking into a cruise around the Mediterranean with a little bit of exploring on one end. I highly recommend the SI Ferry too. The Flagship Brewery is fun. Plus you can drink a beer on the boat (if you so desire) since it’s on the water. Technically, you can drink a beer at the ferry terminal too… open container laws are odd in NYC. then on your way back to Manhattan on the ferry, be sure and be on the lowest level of the boat and then go outside. With the ocean air blowing across you and the scenes of lower Manhattan coming up, it’s very serene and one of my ultimate favorite things in new York. Also, if you want free personal pizzas with a local beer, Crocodile Lounge off of 14th Street between 1st and 2nd Avenues gives you little personal pizza coupons with each drink purchase. Toppings outside of cheese are extra and tips are encouraged but it’s a cheap way to get beer and pizza. Also, Barcade is a lot of fun, if you like old arcade games. It’s not far from Crocodile Lounge and has all the old quarter arcade games and as the name implies, also sells drinks. As others have mentioned, I too recommend the High Line. Hells Kitchen is one of my favorite neighborhood for food/drinks in NYC. I actually met my now-husband at Rudy’s, a very cheap Hell’s Kitchen dive bar, back in 2009. Rudy’s has cleaned up it’s insides a bit and it’s not as cheap as it once was but you can still get free hotdogs there. Lastly, be sure and eat at Shake Shack while you’re in NYC. The chain is becoming more national, but started in NYC and still is one of my favorite burgers. We almost stayed in Hell’s Kitchen, but the hotel was all booked up. We’ll find tine to stroll through. Shake Shack! I went to one once in Las Vegas and it was great! I wonder if it was true to the original though? Shake Shack on the East coast uses beef from Pat LaFreida Meat Purveyors (out of New Jersey). I can’t speak to the quality of Las Vegas, but the beef in the mid-Atlantic is top notch–think dry aged beef. I no longer live in NYC (I lived in Brooklyn, Queens, and Staten Island over a 7-year-span) and live now in the Philly suburbs, but my brother still lives in Manhattan so I visit infrequently (now with a baby-in-tow). While living in NYC, finding the best deals on restaurants and happy hours and other fun cheap things to do was my specialty as I worked in non-profits and was paid accordingly (still do, but better COL in PA), so if you need any feedback on other things, I’m happy to help. Hope you have a great trip! Thanks so much Tara! Super appreciate your offer to help. As we get closer to the date, I’ll probably reach out with specific questions. There are some very good beer bars in NYC. My favorite is The Blind Tiger in Greenwich Village. “I’m working at being mindful of all of the great things going on in my life and beyond.” I very like this speech. 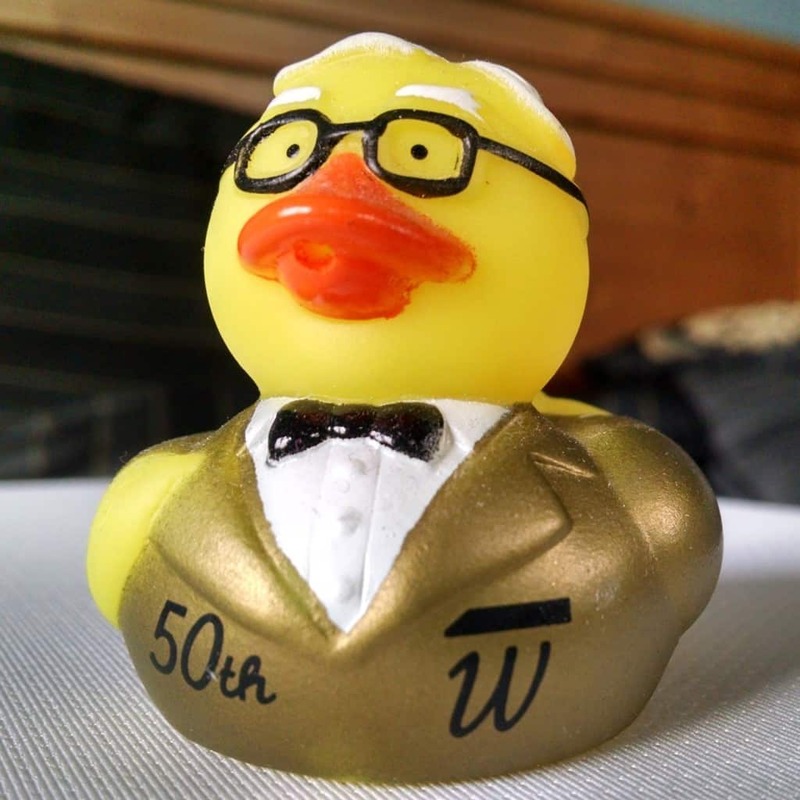 P/S: Can i get the picture Warren Buffett, in duck form? It’s so cute hihi. By any chance did you get a chance to catch the Warren Buffett documentary on HBO last month? It was pretty good, nothing really new, but did serve as a nice background to the man outside of the investment focus.